Free prize inside? Like bacon bandaids aren’t enough of a prize? Really??? Where would one find these? 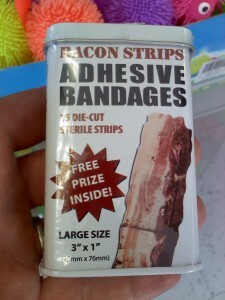 Oh heavens…my son would intentionally be hurting himself just to get to the bandaid! I found those at Fantasy Island, an amusement park near Niagara Falls. It looks like they are also sold on Amazon.com though. I like bacon and all, but that’s kind of gross. LOL!